Last Friday, Kalissa and mom had a few check-ups in the morning. They were a little worried because their appointments were at the same time and they were going to drive together, but didn’t know where to take Carver. 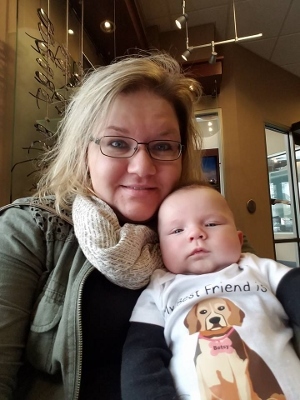 As they were telling me of their woes, I told them that Carver would be hanging with me and we could run them between their appointments–I am one of his favorites after all! Atleast that’s what I tell myself. I had a super busy work week, but was looking forward to Friday all week. I didn’t really need much in town–except for my Carver fix! We met Kalissa at the hospital and them ran over to pick mom up from the other clinic and met her at the door. We then went back to pick up Kalissa, followed by a visit to the Depot. 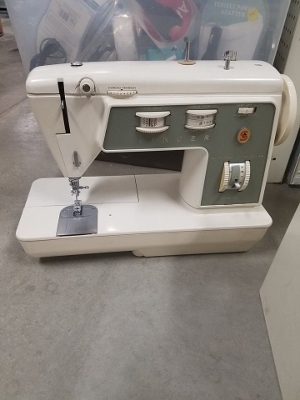 I decided that it must have been a sewing machine day because they had probably 5 or so sewing machines just waiting for a new home. I think that they were mostly priced between $30 and $50 or so, but they all appeared to be in pretty good shape with all of the cords and such. 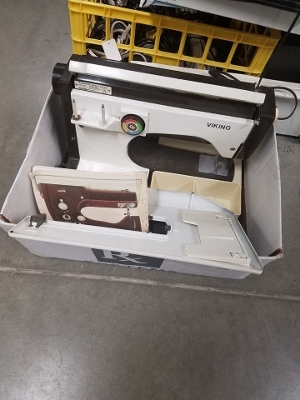 They were marked on their sticker that they worked, however that usually means that when they plugged them in, they turned on so the quality of the stitch or the machine is still unknown. A few even had manuals and additional accessories with them. After checking out the sewing machines, I headed over to the book section and found this. I happen to love books that are perfect for reading on the toilet, and I believe that this one will serve that purpose well. After that, we headed over to the other used store and found a few deal there too. When that was done, mom had an eye doctor appointment. Kalissa and I ran to Walmart during her exam to pick up a few things and then met her back at the Optometrist to pick out some frames. Carver (and I) weren’t too interested in the paperwork part of frames and measuring for them, so we sat in the waiting area and worked on practicing our selfie skills. Isn’t his onsie so cute!?!?!?!? I ordered it of Etsy. If you can’t see, the name tag has Betsy’s name on it. We also grabbed groceries, switched cars and then headed home. When we got back to Waucoma, we stopped over at Kalissa’s house to help her get a few things done around the house to prepare for her upcoming LuLaRoe launch and then I got a call to work the overnight. While it was a busy day (and night), I got to spend time doing things that I love–Hanging out with my family, bargain hunting, and seeing my residents–So I’m going to count it as a good day! This entry was posted in Uncategorized on January 6, 2017 by Kelli. A most excellent day for you! Your selfie skills are great – but somehow Carver is not his usual smiley self in this one. Cute shirt! “Practicing your selfie skills” ! That’s a riot. And a good way to spend time with a good looking fellow. I would probably have grabbed that old Viking machine if it really worked. They are workhorses. I had one just a little different than that and used it until it was going to be too expensive to fix it. Then I got my used Pfaff 7550…and I hope it lasts forever! i loved reading your post. A perfect day with family, so sweet! Carver’s shirt is just the cutest! Kellie, did nothing come home with you!? Looks like Carver wasn’t playing ball in the smile department. Still, it’s a lovely picture and it’s good to read your blog comments too. Hi Kelli! Happy to see you discovered my book! I hope you enjoy it while…well, you know. It’s not the first time I’ve been told I make for great toilet reading. I need to write a new chapter about that! 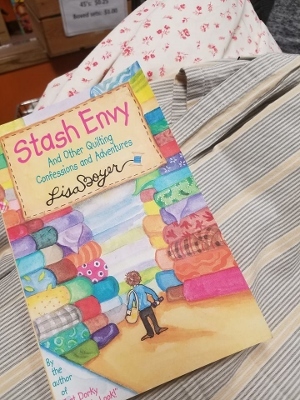 I hope you enjoy Stash Envy. I’m a regular (ahem) reader of your and your mom’s blog and I enjoy your blogging very much! Thanks for sharing your life with us.